We’ve covered numerous file renaming utilities here on the site, and many of them have their own strengths and weaknesses. What I’ve found with a lot of them is that most tend to be difficult to use, but I found one called Rename Master that is both easy and powerful. 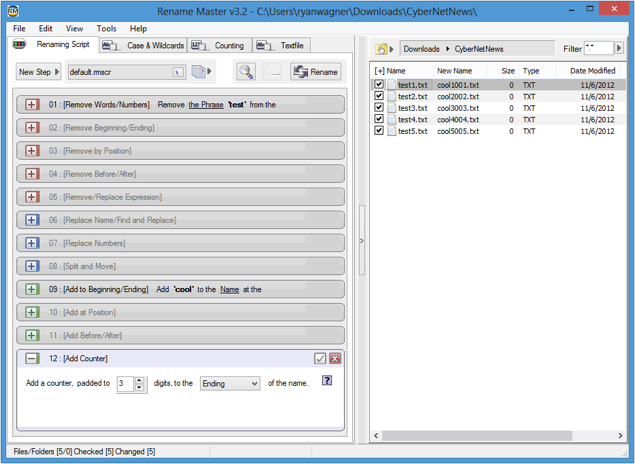 Rename Master provides a simplistic interface for doing things like replacing/adding/removing text in filenames/folders as well as many other common operations. If you jump over to the “Case & Wildcards” tab there is also an option you can enable for full regular expression support in any of the find/replace operations. That’s something I know a lot of power users want in an app like this. This program has been getting developed for over 7-years so it should come as no surprise that this is as good as it is. The download comes with both portable and installable versions depending on which you prefer.